The Race and Slavery Petitions Project has created a microfilm edition of all petitions and documents in the collection published by University Publications of America and later LexisNexis in Bethesda, Maryland. The original legislative petitions can be found at respective state archives. The original county court petitions are available at both state archives and county court houses. Microfilm copies of the original petitions and related documents are published under the title Race, Slavery, and Free Blacks: Petitions to Southern Legislatures and County Courts, 1775-1867. The microfilm version consists of 151 reels, accompanied by seven guide/indexes totaling about four thousand pages. The Race and Slavery Petitions Project also published a two-volume, book edition of selected petitions, roughly 2 percent of the petitions held in the collection. The complete collection of original manuscript documents on microfilm can now be acessed online through Proquest's "Slavery and the Law Digital Library", which requires a paid subscription and is available at some libraries. Race, Slavery and Free Blacks, Series 1, Petitions to Southern Legislatures, 1777-1867 (Bethesda, Maryland: University Publications of America, 1998), Microfilm edition, 23 reels. A Guide to the Microfilm Edition of Race, Slavery and Free Blacks, Series 1, Petitions to Southern Legislatures, 1777-1867 (Bethesda, Maryland: University Publications of America, 1999), 450 pp. The Southern Debate Over Slavery, Volume 1: Petitions to Southern Legislatures, 1778-1864 (Urbana: University of Illinois Press, 2001). Race, Slavery and Free Blacks, Series 2 Petitions to Southern County Courts, 1775-1867; Part A Georgia (1796-1867), Florida (1821-1867), Alabama (1821-1867), Mississippi (1822-1867) (Bethesda, Maryland: LexisNexis, 2003), Microfilm edition, 21 reels. A Guide to the Microfilm Edition of Race, Slavery and Free Blacks, Series 2 Petitions to Southern County Courts, 1775-1867; Part A Georgia (1796-1867), Florida (1821-1867), Alabama (1821-1867), Mississippi (1822-1867) (Bethesda, Maryland: LexisNexis, 2003), 509 pp. 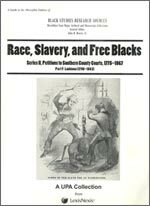 Race, Slavery and Free Blacks, Series 2 Petitions to Southern County Courts, 1775-1867; Part B Maryland (1770-1866), Delaware (1779-1857), District of Columbia (1803-1865) (Bethesda, Maryland: LexisNexis, 2003), Microfilm edition, 16 reels. A Guide to the Microfilm Edition of Race, Slavery and Free Blacks, Series 2 Petitions to Southern County Courts, 1775-1867; Part B Maryland (1770-1866), Delaware (1779-1857), District of Columbia (1803-1865) (Bethesda, Maryland: LexisNexis, 2003), 409 pp. Race, Slavery and Free Blacks, Series 2 Petitions to Southern County Courts, 1775-1867; Part C Virginia (1775-1867) and Kentucky (1794-1864) (Bethesda, Maryland: LexisNexis, 2005), Microfilm edition, 22 reels. A Guide to the Microfilm Edition of Race, Slavery and Free Blacks, Series 2 Petitions to Southern County Courts, 1775-1867; Part C Virginia (1775-1867) and Kentucky (1790-1864) (Bethesda, Maryland: LexisNexis, 2005), 695 pp. Race, Slavery and Free Blacks, Series 2 Petitions to Southern County Courts, 1775-1867; Part D (North Carolina (1775-1867) and South Carolina (1784-1867) (Bethesda, Maryland: LexisNexis, 2005), Microfilm edition, 25 reels. A Guide to the Microfilm Edition of Race, Slavery and Free Blacks, Series 2 Petitions to Southern County Courts, 1775-1867; Part D (North Carolina (1775-1867) and South Carolina (1784-1867) (Bethesda: LexisNexis, 2005), 822pp. Race, Slavery and Free Blacks, Series 2 Petitions to Southern County Courts, 1775-1867; Part E (Arkansas 1824-1867), Missouri (1806-1860), Tennessee (1792-1867), and Texas (1830-1867) (Bethesda, Maryland: LexisNexis, 2005), Microfilm edition, 26 reels. A Guide to the Microfilm Edition of Race, Slavery and Free Blacks, Series 2 Petitions to Southern County Courts, 1775-1867; Part E (Arkansas 1824-1867), Missouri (1806-1860), Tennessee (1792-1867), and Texas (1830-1867) (Bethesda, Maryland: LexisNexis, 2005), 551 pp. Race, Slavery and Free Blacks, Series 2 Petitions to County Courts, 1775-1867; Part F Parish Courts (Louisiana 1795-1863) (Bethesda, Maryland: LexisNexis, 2005), Microfilm edition, 18 reels. A Guide to the Microfilm Edition of Race, Slavery and Free Blacks, Series 2 Petitions to County Courts, 1775-1867; Part F Parish Courts (Louisiana 1795-1863) (Bethesda, Maryland: LexisNexis, 2005), 557pp. The Southern Debate Over Slavery, Volume 2: Petitions to Southern County Courts, 1775-1867 (Urbana: University of Illinois Press, 2008). *All volumes of book and microfilm editions edited by Loren Schweninger; Microfilm Guide, Series 1, assistant eds. Robert Shelton and Charles Smith; Microfilm and Guide, Series II, Parts A, B, C, D, E, assistant editor Marguerite Ross Howell; Microfilm and Guide, Series II, Part F, assistant editor, Nicole Marcon Mazgaj; Southern Debate Over Slavery, volume 2, assistant editors Marguerite Ross Howell and Nicole Marcon Mazgaj. The following libraries and institutions have acquired some or all of the microfilm series. For additional and updated information, search WorldCat.